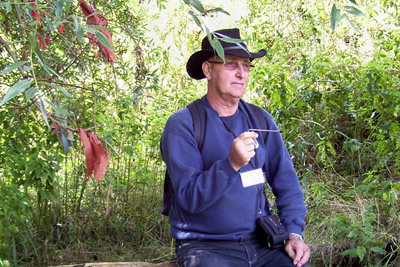 Welcome to my website where you will find details of the courses that I run covering aspects of Dowsing. The aims of the courses are to support those people who share an interest in the field of dowsing. My aims are to take total beginners to an acceptable level where they will be practised in the use of all dowsing tools and tackle dowsing targets with a confident manner. There are courses for those who have dowsed for some time and wish to further their knowledge in the Earth Energies field. If your interest lies within the landscape of this wonderful planet you may wish to follow the GEOMANCY path. Bill Holding dowsing at Swallow Head Spring, Avebury. My interest in the dowsing world started around 28 years ago. It started, like many others, by locating an underground water source, a house mains pipe. Little did I know, that event started me on the road to a fascinating, ongoing discovery of what Mother Nature had to offer me in the wonderful world of dowsing. Many years later, my interests were leading me towards, what we call today, as Earth Energies/Geomancy. I have been taught by one the best Geomancers in the country, Dr Patrick MacManaway, to whom I owe a debt of gratitude for imparting knowledge on this subject. The governing body of the dowsing world in the UK and with high recognistion throughout the world is The British Society of Dowsers. A body of people dedicated to furthering knowledge about dowsing and it’s associated interests. Past Registered Tutor of British Dowsers, who’s aim was to teach dowsing on a uniform level. I am Chairman of Ridings Dowsers, a dowsing group in Yorkshire, where members meet on a monthly basis at site meetings and winter workshops covering a variety of dowsing and associated aspects.